This sophisticated cocktail made of Bio minerals and Bio organic additives of vegetable origin, for the organic grower N-P-K containing additive for flowering plants. This amazing product fits perfectly into the organic base line of the ATA Organics. Bio Bloombastic® is an enrichment for the serious, passionate organic grower who aims to grow high yields. When used properly, Bio Bloombastic® wil produce big beautiful compact deeply fragrant flowers and fruits with an organic flavor. Bio Bloombastic® is a product with a strong concentration which can be used in the last 4 to 6 weeks of the flowering stage. 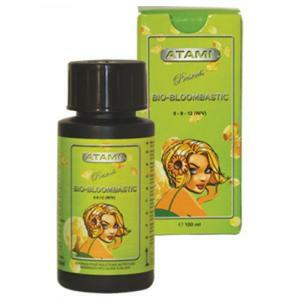 Bio Bloombastic® gives an increase in the E.C. (Nutritional value) on your base nutrient solution. • Enzyme-like processes on different fronts. • Huge increase in final weight. • Stimulation of harder cell structures. Bio Bloombastic® is NOT suitable for irrigationsystems. 1 ml - 2 ml per 1 liter of nutrient water.